Here’s a bit from “Leaving the Turtle,” one of the stories from my science fiction collection, OTHER EARTH, OTHER STARS. In this, the young woman detailed to show the visiting Earthlings around has to negotiate the delicate business of frightening the natives enough to keep them at bay, but not enough to make them feel safer just killing everybody. I shouted a word of greeting in their language. The natives ducked and glared at the sky, easing back under the edge of the canopy. “Will they take our planet back to Earth?” White-nose asked. Oh, don’t you hope so? “No. They will leave us where we are, too.” . . .At least, I assumed they would. I suddenly flamed with curiosity to see Earth, or at least to see something besides the land within and close to our fortifications, large as that was. The natives blended into the shadows again and appeared to be gone. “There is the Bowl,” I said. 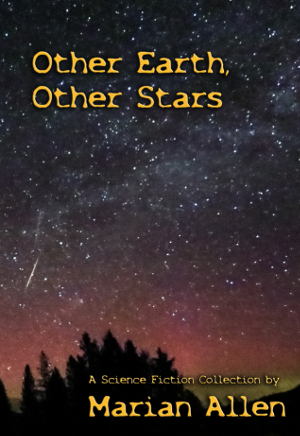 You can buy OTHER EARTH, OTHER STARS for your very very own! A WRITING PROMPT FOR YOU: A relative from far away comes to visit. This entry was posted in Sample Sunday. Tagged science fiction, short stories. Get this book! Find out what happens next! It is totally worth it!